Obviously I press try again. It doesn't work. A few hours ago I used that account to get some US apps. However, I think I can logged in just fine afterward. 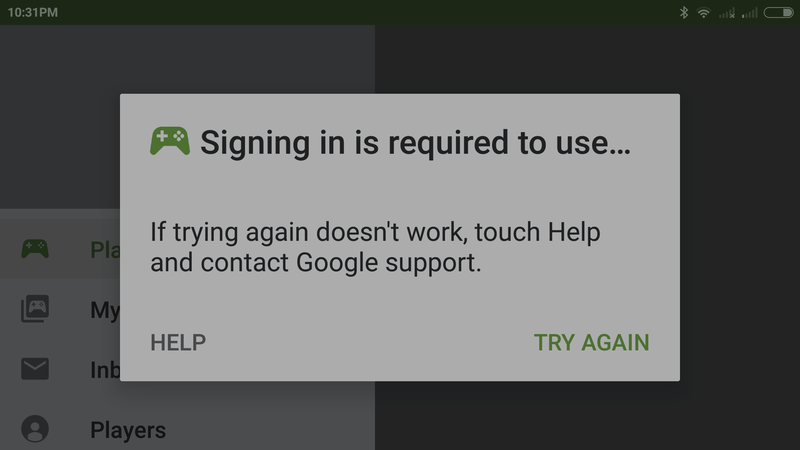 Then suddenly I couldn't sign in to google play on that account. It happens very recently. It's at roughly the same time google is asking me to create new ID. Only happens on my xiaomi phone. I can play clash of clans with that account just fine at bluestack. The other 2 accounts work fine on my xiaomi phone. I tried deleting google play games app data. Removing and readding the account. Nothing works. The account works well on other phone or devices. Other google apps works fine. drive, maps, youtube. All fine. Just google play game that somehow can't login to that account and only to that one specific game. Google is in the process of switching to Gamer ID's. They've been rolling this out for around 6 days now since they announced it (they're further moving away from Google+). Until you get the notification to choose your Gamer ID (or go into Play Games and receive a popup notification to choose yours), you could temporary downgrade your version of Play Games. Third, uninstall your current Google Play Games, and install the downloaded Play Games. So basically I tried to switch to the account. Didn't work. So I go to google play. I switch to the account there. Rather than asking for login it asks me to gives id. It works. So basically what AMZMA says is correct. It's a temporary thing. However, it can only be fixed by going to google play and switch to the account. Not the answer you're looking for? Browse other questions tagged google-play-store or ask your own question.